The question is from the topic triangles. The sides of the triangle are given and we have to find out the distance between the orthocentre and the circumcenter. CAT Geometry questions are heavily tested in CAT exam. Make sure you master Geometry problems. It is a very simple Question. 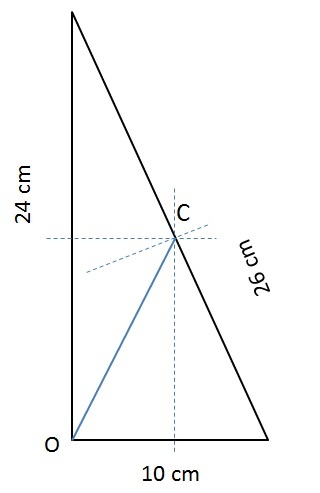 Question 29 : What is the distance between the orthocentre and the circumcenter of a triangle who sides measure 24 cm, 26 cm and 10 cm? Method of solving this CAT Question from Triangles: All you have to do is, find out what type of triangle it is, locate its orthocenter and circumcenter. The sides measure 24 cm, 26 cm and 10 cm. 10, 24, 26 is a Pythagorean triple! So it is a right angled triangle we are talking about. Draw the perpendicular bisectors to get the circumcenter. Orthocenter is the point where all altitudes meet. In a right angled triangle it is the vertex that makes 90 deg angle. Now it is easy to find OC! It is the length of the diagonal of the rectangle formed. The question is "What is the distance between the orthocentre and the circumcenter of a triangle who sides measure 24 cm, 26 cm and 10 cm?" Hence, the answer is 13 cm.